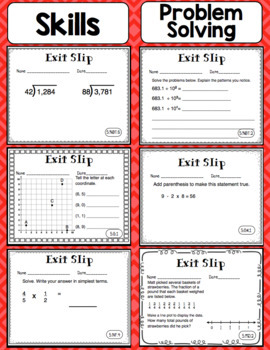 Math Exit Slips 5th Grade Common Core (All Standards Mega Bundle) Formative assessment has never been easier! 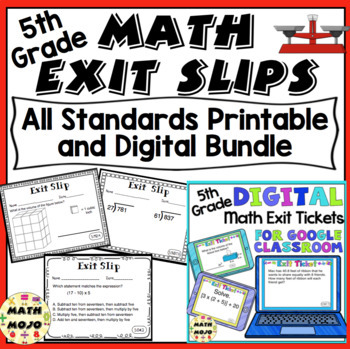 This pack has 5 sets of 5th grade math exit slips for each of the 5th Grade Common Core Math Standards. You also receive a bonus test prep section with an additional slip for each standard! There are over 180 exit slips in this packet! Exit slips also called exit tickets make formative assessment easy! Exit slips allow teachers to do a quick check of student understanding of concepts taught in class. At the end of class or a lesson students fill out the slips and hand them in as a exit “ticket” out the door. In a self contained classroom exit slips or exit tickets can be used to help transition as students “exit” one subject or activity and move on to another. Teachers can quickly assess student understanding. This pack makes using this powerful assessment tool simple! ★ By purchasing the bundle, you save 30% off of the price of purchasing the games individually!